Good Fences Make Good Neighborhoods was an entry into the 2012 San Francisco Urban Prototyping Festival hosted by GAFFTA, ReBar, IDEO and the 5M Placeworks. This festival explored how things like accessibility to coding and the democratization of physical computing (ie, Arduino) can inform urban design. So take great ideas for cities, add DIY/maker ethos, mix, repeat. The projects were meant to be cheap and replicable. Good Fences ended up being more of a completed art project than prototype of anything, but it did serve to get many people thinking about sound + cities in a new light. 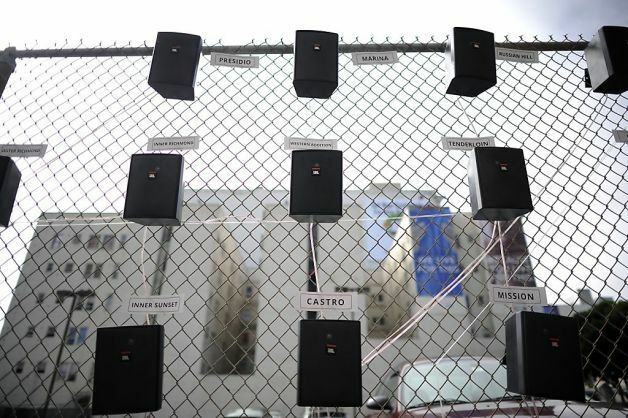 Also, it was a great excuse to hang 19 loudspeakers on a chain-link fence! Trees planted in San Francisco from 1980, based on data from the SF Urban Forest Map. Six sections of the city are presented in a binaural soundscape (meant to sound as if you were standing in front of the loudspeaker array). The creaking, snapping sounds represent a tree planted in that location. The amplitude of the rustling sound represents the total amount of trees planted. The piece goes from 1980 to 2012 over the course of 3 minutes. Emily and I would like to thank Toby Lewis, Megan Gee, Morgan Kanninen and Brian Huey for their help with this project.